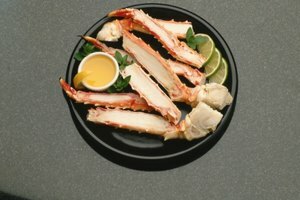 Imitation crab meat fits right in with many seafood recipes. It is, after all, actual fish (usually pollock)—it’s just not real crab. Use it in seared crab cakes, stir-fry or even cold dishes like salads. Because of the way it’s processed, you don’t even have to cook it if you don’t want to. Whip up some crab cakes by mix the imitation crab meat with bread crumbs, an egg, diced celery, chopped fresh dill, mustard, lemon and a touch of mayonnaise. Combine the ingredients and form small patties. Let the patties chill in the refrigerator for a while. When ready to cook, heat a skillet, add oil and sear the crab patties until golden brown on both sides. Gather up some veggies, like onions, baby corn, bell peppers, pea pods and broccoli. Add them to a hot skillet with oil. Once the veggies are tender, toss in chopped imitation crab meat. (Add it last so it doesn’t overcook and dry out.) Serve with rice. Create a filling for stuffed fish with imitation crab meat, fresh dill, salt, pepper and a touch of mustard. Pick up a couple fillets of flat white fish, such as cod or haddock. Cut the fillet in half, leaving two shorter pieces. Add a few scoops of the filling to each piece and roll them up. You can also fillet the fish lengthwise, so it opens up like a book, and stuff the imitation crab meat inside. Place the stuffed fish into the oven and cook to a minimum internal temperature of 145 degrees Fahrenheit. Have imitation crab meat for breakfast in a protein-rich omelet or scramble. Chop onions, mushrooms and peppers, and heat them in a small sauté pan with a drizzle of oil. Once the veggies are soft, add in small pieces of imitation crab meat. Break a few eggs into a bowl, whisk, and pour them into the pan to form an omelet, or mix it all up to make a scramble. Sprinkle with a little Monterey Jack or white cheddar cheese for added creaminess. Don’t stress if you don’t have time to cook a hot meal. Make a chilled imitation crab salad. 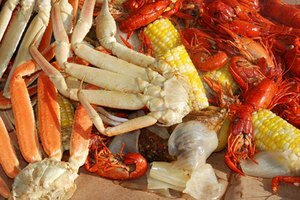 Toss the crab in mayonnaise, Worcestershire sauce, lemon, finely diced green onions, bell peppers and a drizzle of hot sauce, if desired. Taste it as you’re mixing until you have the flavor you want. Serve it in lettuce wraps, chopped salad or a sandwich roll. Food Republic: What Is Imitation Crab? Texas Cooking: Just Itchin' for Some Imitation Shellfish!